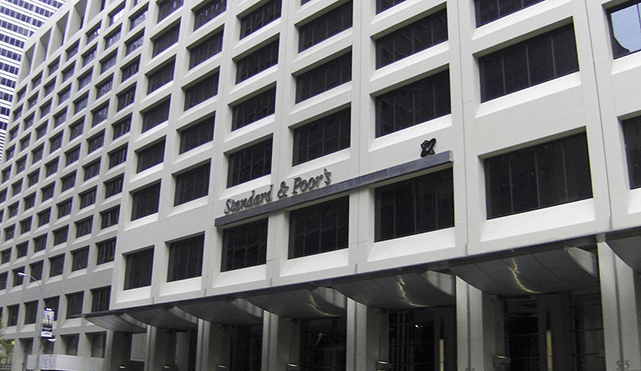 OPINION: Ratings agencies need to incorporate natural resource-related risks. Standard & Poor's Headquarters in Lower Manhattan, New York City. CC-BY-3.0. The bond markets have grown into a $100 trillion oxygen chamber for finance ministries and businesses. Standing at the gates are Standard & Poor’s Ratings Services, Moody’s Investors Service and Fitch Ratings – the most powerful oligopoly in the world. The Big 3 have a 95 per cent market share of the global credit ratings market, which gives them the power to deem who breathes in the capital markets and who suffocates. The rating agencies serve a critical function labelling which debt is safe, but they are only as good as their proprietary models. Sometimes the models miss important factors, like when they slapped AAA ratings on financial products based on mortgages extended to NINJAs (folks with No Income, No Job and no Assets). From the time of tulip mania in the 17th century, bubbles have been a reality of capitalism. The question is, what will the next asset bubble be and how can we begin to deflate it? The conventional wisdom chalks the European sovereign debt crisis up to there being more Porsches in Greece than taxpayers declaring 50,000 euro incomes. But the reality is more ominous. There are strong indications that we may be brushing up against the mother of all asset bubbles: an economic model of growth premised on short-changing Mother Nature. Popping this asset bubble intentionally amounts to “a global suicide pact” in the words of UN Secretary-General Ban Ki-moon. The four countries at the heart of the eurozone crisis – Greece, Italy, Portugal and Spain – have something in common. They not only had their sovereign debt harshly downgraded, but are also among the largest ecological debtors in the world, running the green into red at twice the eurozone average, according to the Global Footprint Network. Shedding further light on how nature is creeping onto balance sheets, the UNEP-backed Environmental Risk Integration in Sovereign Credit Analysis (E-RISC) has found that resource price swings of 10 per cent can push trade deficits up by between 0.2 and 0.5 per cent of GDP. Treating the environment as an off-balance sheet item has always been a ticking time bomb–in the long term. After the Copenhagen climate talks collapsed, the time horizon was pushed even further into irrelevance by the rating agencies. While we were waiting for government to bring nature onto balance sheets, the markets beat them to the punch, thrusting us into an era of rising and volatile resource prices. This is difficult to digest for anyone who lived through a 20th century that delivered rising living standards and a population soaring from 1.6 billion to 6 billion, while prices for the 33 most important commodities declined by 70 per cent. However, in the past decade these declines were completely erased or reversed due to demand from Asia and other emerging markets. Real commodity prices have risen by 147 per cent since the turn of the century. With 3 billion more middle class consumers expected to join us by 2030, we are in the midst of a revolution that places resources ahead of capital and labour at the heart of public policy and business strategy, according to a recent McKinsey report. Amidst this resource revolution, rating agencies risk being caught flat-footed once again. The UN Secretary-General’s High-Level Panel on Global Sustainability noted that rating agencies largely ignore environmental issues and “do not take account of likely changes in resource prices.” The panel suggested that if ratings were sensitized to such matters, there would be a more urgent financial interest in mitigating negative impacts and leveraging positive ones. At a time of intense scrutiny by regulators and their large ‘universal owner’ shareholders, rating agencies have a chance to take a proactive approach. Just as the Big 3 have shown leadership in the past by taking into account unfunded pension liabilities and longer-term demographic risks to fiscal health, there is now an opportunity to show leadership by integrating natural resource factors into rating models. The E-RISC methodology integrates 20 indicators to assess natural resource-related risks to sovereign creditworthiness, including most saliently: change in trade balance from a 10 per cent change in resource prices expressed as a percentage of GDP; ratio of the country’s ecological footprint over its biocapacity; and change in trade balance from diminishing productivity due to overuse of productive land and marine areas. Integrating these metrics into ratings models as a starting point would be good for the global economy, good for the rating agencies, and good for the planet. The alternative is to keep ignoring Mother Nature’s signs, which are increasingly less discrete if the massive flooding of Standard & Poor’s executive offices during Superstorm Sandy is any indication.